M is for the many books she covered with brown paper bags so your teachers wouldn’t yell at you, and you would grow up to be wise, responsible adults who know a good thing when you see it. Like the Rascal Chicken Sandwich. Golden brown, juicy WHOLE chicken breast topped with crisp lettuce, ripe tomato and creamy mayo. O is for onions and all the foods they taste great on. Pizzas. Philly Steak Grinders. Gyro Sandwiches. The Italiano. Veggie Grinders. Roman Wraps. Veggie Wraps. Greek Salads. You name it. Mom said they’re good for you. We listen to moms! T is for Buffalo Wings. TOTALLY awesome while spending time with mothers. TASTY, out of this world, dripping with hot or mild BBQ, honey mustard or sweet chili sauce. Show Mom you’re a member of the Clean Plate Club. Show her how well you use napkins. Save licking your face, fingers and the bottom of your plate for when she’s not around. H is for hearty, heaping and heavenly. As in, Mom and I ate a hearty meal from Rascal House, including a heaping cup of heavenly fries. This alone made her happy even after I told her I forgot to do my homework. Look ma, 2 more H-words! E is for Ed Sr. and Ed Jr. They brought Ed Sr’s. mom (Ed Jr’s. grandma) a Pepperoni Extreme pizza and Garlic Sesame Breadsticks on Mother’s Day last year. At first, they were only going to bring the Pepperoni Extreme pizza. But then Ed Jr. suggested they bring Garlic Sesame Breadsticks, too. Good thinking, Ed Jr. Sometimes, two Eds think better than one! R is for Rascal House. Nuff said. 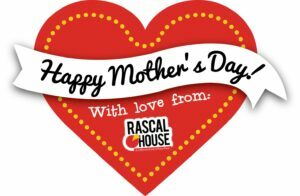 Share your Mother’s Day photos with us on Twitter or Instagram using #RascalHouse, or post on our Facebook page!